‘A man comes. He travels over water. 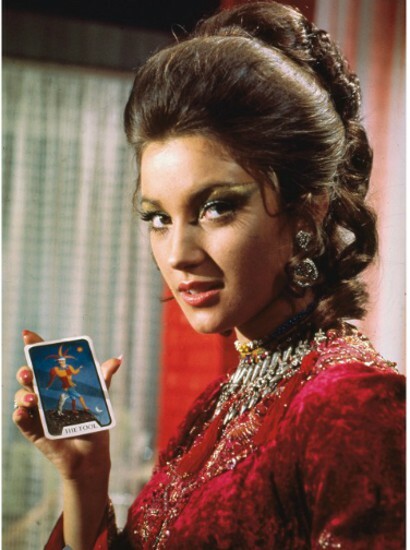 He brings violence and destruction.’ Remember that reading from Solitaire, tarot-reader extraordinaire, in Live and Let Die? I’ve never forgotten it. The film had voodoo, an evil drug lord, tropical islands. And tarot. Magic was afoot; some kind of mystery I wanted a part of, and still do. And of course, there were Solitaire’s magnificent outfits. No sackcloth for her, rasping fortunes from a damp cave or forest hut. Solitaire was just so… glamourous. She wore metallic eye shadow. She had a magnificent red feathered headdress and matching cape and her own desk for readings. Just to break the spell for a moment, the film is loaded with racial stereotyping. Then there’s the misogyny. See our Solitaire, imprisoned on the fictional island of San Monique in the Caribbean lest she falls in love and loses her power? Evil crime-lord Dr Kananga, the ruler of San Monique, values only her virginity and her prophesies. But this passed way over my ten-year-old head, watching Solitaire lay out Fergus’ Tarot of the Witches, the deck used in the film. It was the first tarot I had seen, and Solitaire, beset with jewels, beauty and mystery, was the locked-away Princess about to be rescued by fair Bond. Here’s Solitaire’s spread, as seen in Live and Let Die, along with how you might allocate the card positions in a reading. 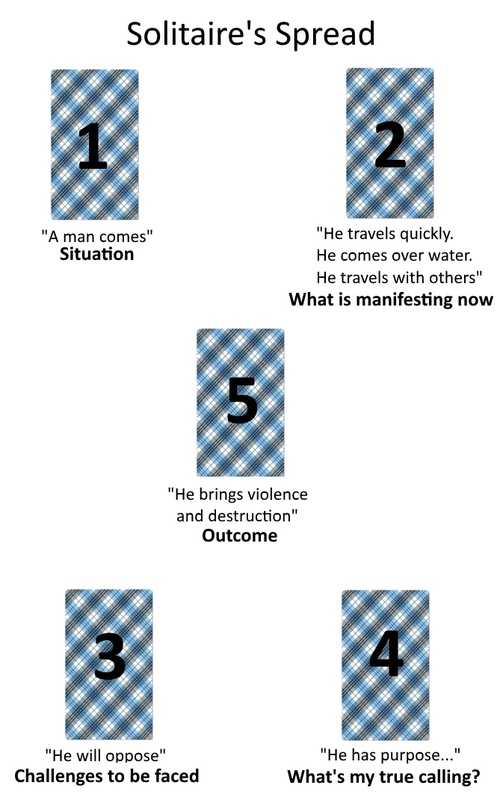 I first developed this reading when researching The Ultimate Guide to Tarot Spreads. Difficult to see the exact card positions from the film, but I’ve followed Solitaire’s layout as closely as I could.